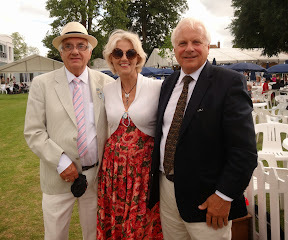 Yesterday saw the conclusion of Henley Regatta for yet another year. Established in 1839 this year celebrates its 175th anniversary. 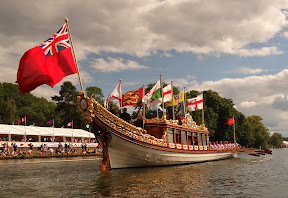 So it was fitting that the beautiful Royal Barge 'Gloriana' came here to grace the Thames at Henley this year. I took this picture from our vantage point next to the booms in the middle of the river. 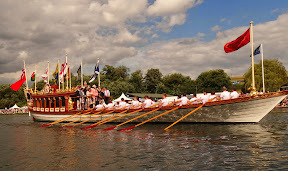 Wonderful to see the Gloriana in action with all eighteen oarsmen rowing in perfect unison as they glided past us. My young friend, at the helm of my little wooden dinghy, had steered us towards the middle of the river where we, with difficulty (at least at my end of the boat) managed to throw the ropes over and then back under the floating wooden booms to secure our mooring. 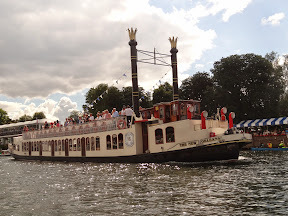 The Gloriana was built as a tribute to Queen Elizabeth II for her Diamond Jubilee and was the lead vessel in the Thames Diamond Jubilee Pageant. There she goes - back up the river to moor at Leander Club. 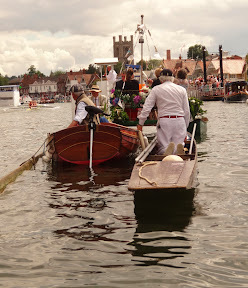 We've had fantastic weather this year for the Regatta. My little party got together on Friday morning at Phyllis Court to enjoy the day in the elegant ambiance of the club. (I'm not so keen on the frenetic and crowded Stewards Enclosure on the opposite side of the river). Paul, my cousin, ordered a large jug of Pimms and we settled down around a table on the lawn under a nice shady umbrella. Soon, however, the peace was shattered by several huge gusts of wind, one of which lifted the umbrella out of its socket and into the air. This resulted in the whole table upending, scattering the Pimms, our smashed glasses, and everything else over the grass. My young friend's handbag and dress, Jilly's dress and my hat were all victims of the carnage. Jilly's white dress collected most of the Pimms (but she tells me that it has cleaned successfully). 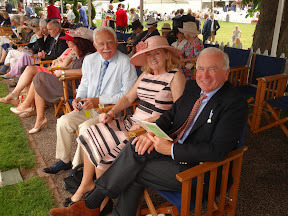 Being the rather excitable type, I was a bit annoyed about my brand new straw hat being stained orange, but unknown to me at the time the President of the Club was standing right by our table. Very kindly, and with smooth efficiency he just escorted me to the hat stall by the river and treated me to another new Panama hat. 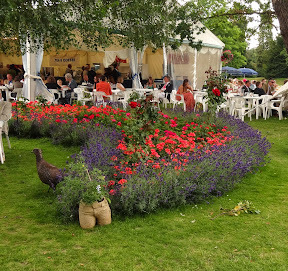 We also were treated to a couple more jugs of Pimms, courtesy of Phyllis Court Club - even though the wind wasn't actually their fault! The only person that was missing when we went to lunch was Jane Simmonds. As we went to the dining room there she was in the lounge. Poor girl had been sitting there for two hours as she couldn't find us. We'd both been texting each other during the morning but no messages went through because it appeared Vodafone couldn't cope with the number of calls being attempted by the thousands attending the regatta. Anyway it ended well because the leisurely lunch was delicious. Later we made our way to the deck chairs to watch the rowing. Here's Brian, Jane and Graham. And here am I with Jane (2) and Paul. This is a scene by some of the flower beds and sculptures dotted around the grounds. 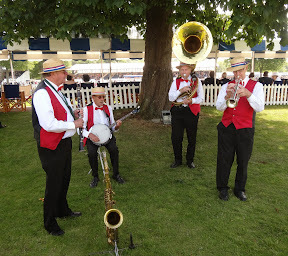 We were entertained by a quartet of travelling jazz musicians. I can't leave the regatta without showing at least one picture of what it's all about. And while we were tied to the booms on Sunday right next to us was Rodney Bewes - looking down towards the finishing post from his little wooden boat. 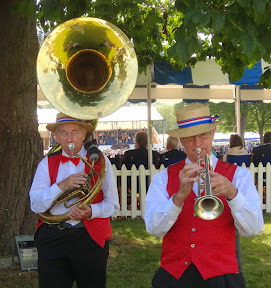 So much goes on during the regatta that everywhere you look you can find something interesting. Here, for example is The New Orleans riverboat in all its glory. What with all this river activity going on its so frustrating that I can't use my big boat at the moment. Unfortunately, during the floods at the beginning of the year, apart from the engine and interior being damaged the starter motor doesn't work. I ordered a new one but the attachment has changed and it can't be fitted properly. So I'm hoping that the old one can be repaired successfully. My sister-in-law Val, went to hospital in Oxford last week to have a hip replacement. She's fine - all went well. My young friend and I called in to see her on Tuesday and again on Sunday afternoon. Louisa and her family were all there too. (Louisa has been marvellous in arranging Val's operation and keeping all the family informed of everything daily). Today she has moved her mother to St Luke's nursing home close by the hospital where Val will stay for probably a week before she goes home.